WORCESTER, Mass. – In the bottom of the fourth inning, Wachusett started to hit the ball hard, scoring a run on back-to-back doubles and cutting into the Taunton lead. Although the Tigers still led by three runs, momentum appeared to be shifting to the Central champs and Taunton went to the plate looking for an instant response to take back control. With one run home, the Tigers had the bases loaded with two outs and up stepped junior Alexa White. Wachusett starter Courtney Lanpher got two strikes on Taunton’s second baseman, but then White turned on a pitch, lifting it to deep left. The Taunton bench was almost holding its breath watching the ball sail towards the fence and almost exploded when the ball cleared it. White’s grand slam broke Saturday night’s Div. 1 state championship game wide open, lifting Taunton (26-2) to a convincing 13-2 win over the Mountaineers and ending an 11-year wait for the program’s fifth state title. “It’s almost surreal,” said Taunton coach Dave Lewry, who earned his fourth title as coach of the Tigers. “I began to question whether I was ever going to get another one, you know? It just hasn’t sunk in yet, but these kids deserve it. The whole team just worked so hard for it. Throughout the playoffs, as a team, the Tigers have talked about trying to win this title for the senior class, which before this year had gotten as far as the South sectional final four years ago. On Saturday, they fulfilled that mission. “They worked so hard all these years and for us to finally have a chance for it, we really wanted them to have it,” said freshman Hanna Aldrich. The Tigers jumped in front in the first. Junior Jaime Brown (2-for-3) lined a single to center, moved to second on a sacrifice bunt from Liana Duarte (3-for-4), and then scored on a single by Kya Enos (2-for-4). All three played on the Taunton team that reached the South final in 2015. In the third, Taunton got some breathing room. Brown drew a one-out walk and stole second. With two outs, Enos drew a walk and Mackenzie Handrahan knocked a single through the left side of the infield. Brown was able to slide in ahead of the tag. Aldrich (2-for-4) followed with a single of her own, which scored Enos and Handrahan for a 4-0 lead. Wachusett got its first base runner off Kelsey White with two outs in the fourth. Ellie Moore doubled to left center and then Reagan Lowe bounced one off the fence in center to drive her in. Paige Arvidson smashed a line drive right back at White, who snared it to end the inning. The energy was suddenly much higher from the Wachusett fans and the Mountaineers looked rejuvenated. That lasted only a few hitters. Duarte started the rally with a one-out single. Enos reached on an error and Handrahan on a fielder’s choice after another error trying to get the lead runner. Aldrich drove in her third run of the game with a bouncer over the pitcher that left the shortstop in no man’s land. After Lanpher got Kelsey White to pop up to the catcher for the second out, the Mountaineers looked like they may just escape the inning having only allowed a single run, but Alexa White stepped in to give her sister, and the team, a lift. The grand slam made it 9-1 and had the Tigers cruising. Emily Todorov started the bottom half of the inning with a solo shot to left, but then Alexa White flashed the leather at second to record the next three outs. Twice she made plays to her left, cutting down grounders in the hole between first and second and then, after a Wachusett single, she tracked one down up the middle and had the presence of mind to tag the base for the force. Any hope that Wachusett had of a comeback was dashed in the sixth. Taunton continued to stretch the lead and the top of the order continued to come through with big hits. Brown started it with a double to center and Duarte followed by lining a double over the left fielder’s head. She would come around to score again on an Enos single to left and it was 11-2. In the seventh, Taunton brought players off the bench to give them a taste of the final and extended the lead further. Freshman Tayah DaCosta, who was pulled up from JV for the postseason, lined a single in her first at-bat of the playoffs. Abbie McDonough, who played right field, followed with a double to put two in scoring position. Hailee Hartung drove in one with a groundout to second and Duarte beat out an infield single to drive in another. With a strong defense behind her, Kelsey White closed out the game with a clean seventh inning. 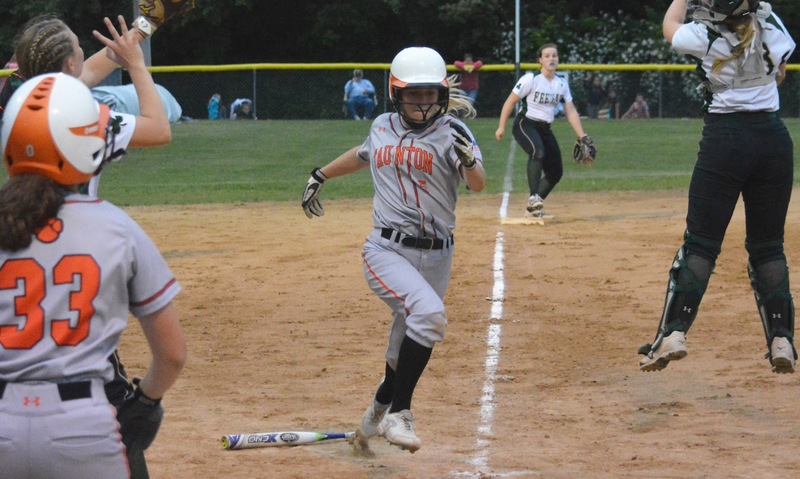 The freshman allowed only five hits from the Mountaineers and continued a strong tournament run that saw her allow no more than two runs in any of Taunton’s six playoff games. With two outs, the ball was hit on the ground to Brown at third and she, as she has done countless times before, fired a strike to first base. Unlike all those other times, this one was for a state championship and to complete a mission that the Tigers had set out on at the start of the season. “I’m surprised I’m not crying because I’m so happy,” Alexa White said. “I’m just in shock because this is so incredible and I’m so happy for the seniors and…there are no words, literally no words. WORCESTER, Mass. – Quiet, inspirational, and crazy — the perfect combination. That’s how Taunton head coach Dave Lewry described each of his three senior leaders — Liana Duarte, Kya Enos, and Mackenzie Handrahan. 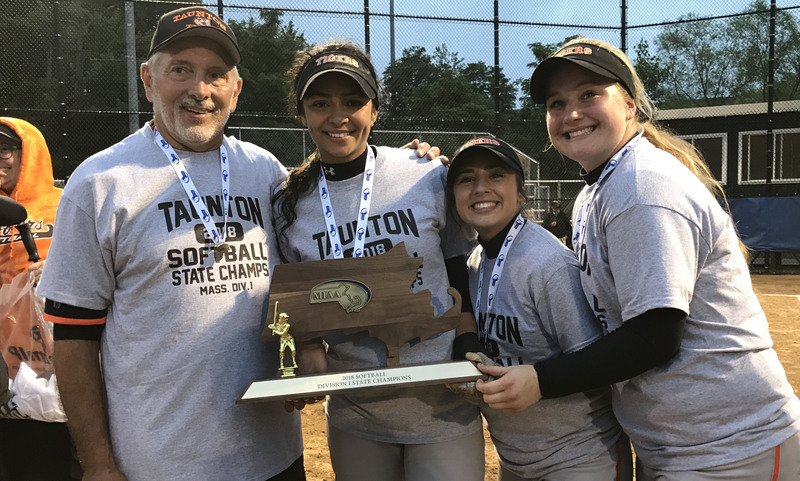 All three of those Tigers played a vital role this season, and unsurprisingly, were a big part of Taunton winning the D1 State Championship with a 13-2 decision over previously unbeaten Wachusett. “They are the nucleus of the team,” Lewry said. “What a great combination of seniors. I never had to use the word ‘senioritis’ this season. Usually, we have to talk about it with them being out of school at the end of the season. But we never had to mention it all year and that’s a tremendous credit to those three. The three seniors weren’t just strong leaders off the field, they led by example on the diamond as well. Each Duarte (3-for-4), Enos (2-for-4), and Handrahan recorded a hit, drove in at least one run, and scored at least once in the Tigers’ big win. It didn’t take long for Taunton to take a lead with Enos responsible for giving the visitors a lead in the first inning. After a leadoff single from Jaime Brown, the junior moved to second on a perfect sacrifice bunt from Duarte. That brought up Enos, who slapped a base hit up the middle into the outfield to bring Brown home for a quick 1-0 advantage. Just two innings later, the top of the order helped Taunton increase its lead. Both Brown and Enos walked before Handrahan drilled a hard grounder up the third base line, bringing a run home. Enos and Handrahan came home to score on a single from freshman Hanna Aldrich to make it 4-0 in favor of Taunton. “They worked so hard all these years and for us to finally have a chance for it, we really wanted them to have it,” Aldrich said of the seniors. The three seniors, who combined for half of Taunton’s 12 hits and were responsible for driving in five runs and scoring five runs, were the catalysts of the Tigers’ biggest inning — the fifth inning. Duarte got things going with a one-out single, Enos reached on an infield error, and Handrahan took first on a fielder’s choice when Duarte beat the throw to third. A base hit from Aldrich brought Duarte home but kept the bases loaded. Junior Alexa White delivered the big blow with a two-out grand slam to put Taunton ahead 9-1. A solo shot from Wachusett in the bottom of the fifth grave the Mountaineers a tiny bit of momentum but Taunton came back with a big response in the sixth inning. Duarte drove Brown in with a double and Enos sent Duarte home with a single to make it 11-2. Enos admitted that although it’s sad that the trio won’t play together again in a Taunton uniform, it was the perfect ending to a storied career. LOWELL, Mass. – It is a long trip from Taunton up to Martin Field in Lowell through late afternoon traffic, but the Tigers apparently arrived on their coach bus ready to go for Tuesday night’s state semifinal. 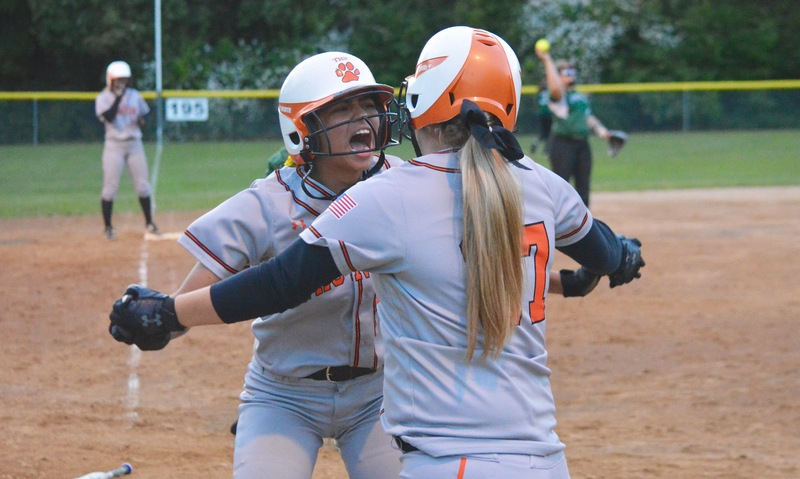 Taunton scored six runs in the opening two innings, Kelsey White had a perfect game into the fifth and allowed only five hits, and the Tigers ended an 11-year wait to get back to the state championship game with a 6-1 win over North champion Newton North. White was masterful in the circle again for Taunton. Just a freshman, experiencing the postseason stage for the first time, White has not been awed by the moment and she retired the first 12 batters that she faced on Tuesday before Mia Bueno singled to lead-off the fifth. Taunton helped out its freshman pitcher with some early runs. The Tigers have been strong with two outs in the postseason and they managed to rally again in the first. Kya Enos lined a single through the hole on the left side for a two-out baserunner. The senior catcher stole second and then came around to score the opening run on a base hit by classmate Mackenzie Handrahan. The Tigers broke the game wide open in the second. This time they did not wait until there were two outs to get started, instead scoring six times before committing one. Kelsey White was hit by a pitch to lead off and her older sister Alexa White followed by drawing a nine-pitch walk. Paige Silvia dropped down a bunt and White hustled into third to beat the throw and load the bases. The hero from the South final, sophomore Rylie Murphy, brought in the first run with a grounder to the left side, reaching on a fielder’s choice to keep the bases full. Brown, Taunton’s lead-off hitter, emptied the bases, drilling a pitch into the gap in left-center for a triple that scored three. The throw to third bounced off Brown and to the fence in front of the Tigers’ dugout, allowing her to come home too. “That’s always across you mind, you want the big hit, but honestly I was just looking for a single to bring a run in and chip away and getting them all in was just a bonus,” said Brown. The Tigers also threatened in the third and seemed to have Newton North on the ropes. Alexa White singled to start the inning and moved into scoring position on a Silvia sac bunt. Murphy singled to left to put two on and was pinch-run for by Abbie McDonough, who promptly stole second. Newton North pitcher Mia Patriacca got Brown and Liana Duarte looking to escape the jam. Taunton did not put another batter on base, as Patriacca retired the final 11 hitters she faced. Newton North finally got something going in the fifth. Bueno singled to left to start the inning, the first baserunner of the night for the North champs. Kira Flegenheimer followed with a single but was forced at second on a grounder to Hanna Aldrich. With runners at the corners, Ciara Gillen hit a weak fly ball into shallow right field that dropped just in front of McDonough and allowed the run to score. White needed to bear down, as momentum seemed to be shifting to the suddenly loud visiting side. She got a grounder to second and then a strikeout to end the inning and preserve a five-run lead. The visitors got a one-out hit in the sixth, but Brown made a nice play on the run to field a short grounder down the third base line and White showed her ability to field her position as she managed to move to her left to snag a tricky grounder. 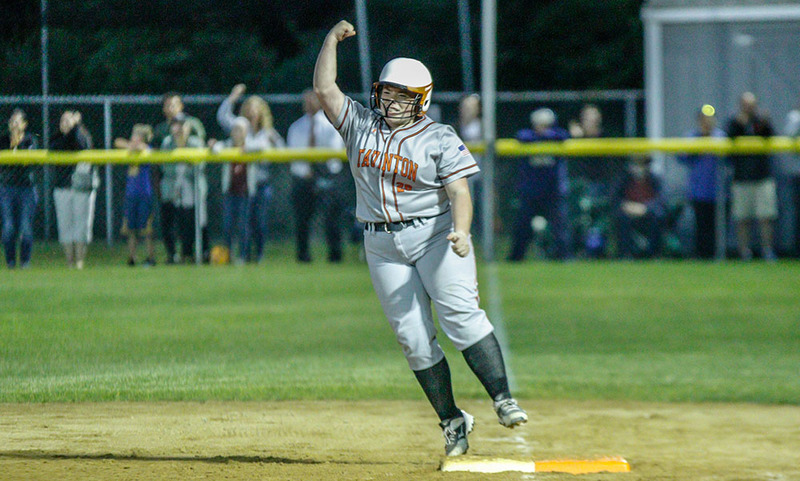 In the seventh, Newton North again got a one-out hit to put the pressure on Taunton, but White induced a grounder to her sister at second to force the lead runner and then struck out the final batter looking to set off another raucous celebration. Taunton (25-2) will face the Central champ Wachusett in the state title game at Worcester State on Saturday at 6:00. Wachusett (much like Newton North in the semifinal) was also at this stage last year and lost to Milford in the championship game. TAUNTON, Mass.- The No. 2 seed Taunton Tigers took an early lead against Bishop Feehan Wednesday night at Jack Tripp Field and didn’t look back as they beat the visiting No. 4 seed Shamrocks 9-1 to advance to the Div. 1 South final. On the mound, Taunton freshman starter Kelsey White put up a strong performance, surrendering just one run and six hits, while striking out two in a complete game win. For Feehan, the loss went to senior Shauna Hamill, who gave up 14 hits, nine runs (six earned) and two walks while striking out two in a complete game performance. At the plate, the Tigers saw several strong contributions, starting from the leadoff spot. Junior third baseman Jaime Brown went 3-for-3 with three runs and an RBI on two singles, a double and a walk. Senior catcher Kya Enos also impressed at the plate, going 1-for-2 with a pair of both runs and RBI. For the Shamrocks, the offense was lead by sophomore catcher Gabrielle Comeau, who went 2-for-3 scoring the team’s only run of the evening. The Tigers wasted little time in getting on the board as a leadoff double by Brown in the bottom of the first put a runner on for the hosts, who would come home off a sacrifice bunt by Enos to make it 1-0. The Shamrocks would push a little in the top of the second, as a leadoff single up the middle by Comeau turned into the tying run three at-bats later as a simple short hit to shallow left by sophomore designated player Hannah Ramer brought in Comeau from third and quickly drew the action back even. However, things wouldn’t stay even for long. The Tigers struck back in the bottom half of the inning, as a single by junior second baseman Alexa White became the go-ahead run off of a base-clearing triple from sophomore first baseman Paige Silvia. Silvia was brought in two at-bats later as a single to left by Brown allowed her to score and make it 3–1 in favor of the home team. The middle innings were fairly quiet for both offenses, as both pitchers settled in to their grooves, particularly Kelsey White, who went three straight innings with three straight outs. The Taunton offense roared back to life in the bottom of the fifth, as walks to Brown and Enos to start the inning gave the hosts a good scoring chance, but they quickly found themselves down two outs. A shallow infield pop up by freshman shortstop Hanna Aldrich looked likely to end the inning, but the ball bounced off Hamill’s glove, allowing Aldrich to load the bases and Kelsey White to clear them with a deep double just an at-bat later, doubling the Tigers’ lead to 6-1. Three more runs would follow as the Tigers batted around in the bottom of the sixth. Six straight singles put Taunton in control, with Enos scoring Brown, senior outfielder Mackenzie Handrahan scoring Liana Duarte and Aldrich scoring Enos respectively, making it 9-1. Comeau lead off the top of the seventh for Feehan with a single, but a comeback wasn’t meant to be for the Shamrocks, as two fielder’s choices and a fly out to right would end both their chances and their season. Three games now separate the Tigers from a D1 state title, and for players like Handrahan, their desire for the trophy grows stronger every day. The Tigers will look to bring it on Friday when they face a familiar foe in the South final – Kelley-Rex rival King Philip. Taunton (23-2) and King Philip (21-3) will face off Friday at 7 p.m. at Taunton High School’s Jack Tripp Field. TAUNTON, Mass. – Dartmouth twice had the lead in Monday night’s Div. 1 South quarterfinal at Jack Tripp Field, but twice Taunton was able to erase the lead with one swing of the bat. Senior Kya Enos and freshman Hanna Aldrich both hit solo shots that brought the Tigers back after falling behind. With the momentum back on its side, Taunton put together a five-run rally in the fifth, all with two outs, to take control of the game. The Tigers would roll to a 9-2 victory that books their first appearance in the South semifinal since 2015. The Tigers had a scoring opportunity in the bottom of the first and a chance to get the early lead. A walk to Jaime Brown and a bunt single by Liana Duarte (3-for-4), who beat the throw, put two on for Enos, but she was unable to make contact against Dartmouth starter Sophia Sousa. An infield hit for Mackenzie Handrahan (3-for-4) loaded the bases, but Sousa got a pop up and a grounder to escape. Dartmouth grabbed the lead with an unearned run in the third. Rachel Pereira drew a two-out walk and advanced to third on a pair of wild pitches from Kelsey White. After Sousa drew a walk, a bouncing ball to second was misplayed allowing the run to score. In the bottom half of the inning, Enos crushed a pitch to left that bounced off the top of the fence and into the trees for a solo homer that energized the Tigers bench. The senior catcher is the emotional and vocal leader of the team and her energy was infectious. It is a role that she has welcomed since joining the program as an eighth grader. The visitors retook the lead in the next inning. Hailey Camire beat out an infield single on a very close call at first and moved to second on a sac bunt. White induced a bouncer back to the circle for the second out, but Sarah Gioiosa lined a single to center to bring in a run. It was one of only two balls that Dartmouth got out of the infield against White. In the bottom of the fourth, Taunton quickly evened the score. Aldrich led-off with a blast to left that easily cleared the fence and nestled into the trees. White settled into her start, limiting the Indians to only two infield singles and a walk over the final three innings. She seemed to get stronger as the game wore on. It always helps a pitcher to feel more comfortable when the offense provides some runs and that is what Taunton managed to do in the fifth. After a pair of groundouts to short, Duarte lined a double to left and Enos followed with a four-pitch walk. Handrahan ripped a ball up the middle that Kayleigh Alonso was able to get a glove on but not field cleanly. As the ball bounced a couple feet away, Duarte scampered home with the go-ahead run. Aldrich showed a good eye to draw a walk and load the bases for Kelsey White and she helped her own cause with a single to left that scored two. Alexa White brought in two more when she followed with a double over the leftfielder’s head for a 7-2 lead. Enos admitted that it took the Tigers time to adjust to the Dartmouth pitcher, who relied on changing speeds and movement rather than trying to overpower hitters. In the sixth, the Tigers tacked on some insurance that essentially put the game away. Brown lined a one-out single to center, stole second, and advanced to third on a wild pitch. Duarte drove Brown in with her third hit of the night, this one a single to right. Handrahan made it 9-2 two batters later with a sliced double down the left field line. The final score was one-sided, but the Tigers faced adversity, rallying twice before taking control, and Lewry thinks this will benefit his team going forward. Taunton (22-2) will face Bishop Feehan in the semifinal on Wednesday at Jack Tripp Field at 7:00. #7 Franklin, 7 vs. #3 St. John’s Prep, 6 – Final – Click here for a Recap and Photo Gallery from this game. #8 Stoughton, 2 vs. #9 Somerset-Berkley, 3 – Final – Click here for a recap of this game. #4 Franklin, 7 vs. #5 Xaverian, 10 – Final – Franklin and Xaverian were tied 6-6 after three quarters but the Hawks used a 4-0 surge in the final frame to pull away from the Panthers. Eric Civetti and Matt Lazzaro each scored a pair of goals for Franklin while Chase Tanner, Jake Davis, and Nitin Chaudhury each found the back of the net once. Connor O’Rourke made 10 saves in net. #6 North Attleboro, 4 @ #3 Walpole, 7 – Final – Click here for a recap of this game. 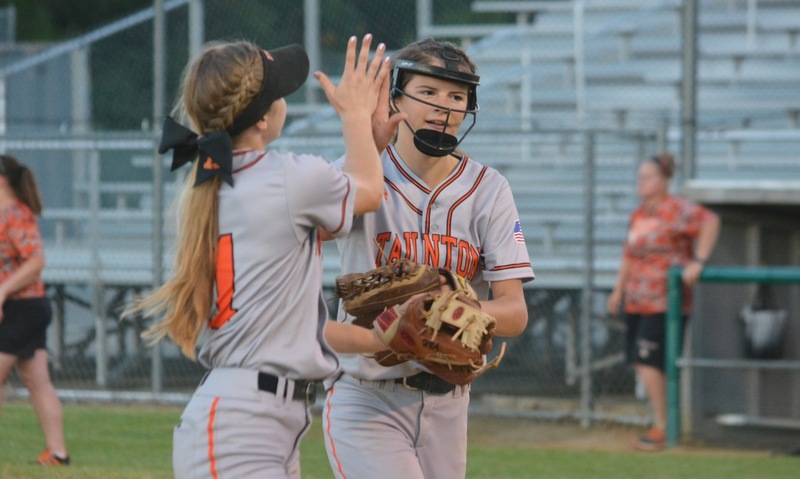 #2 Taunton, 3 vs. #15 North Quincy, 0 – Final – Freshman Kelsey White continued to dominate in the circle for the Tigers, allowing just one base runner (a two-out single in the fifth) while striking out 11 batters to lead Taunton to a shutout win over North Quincy. The Tigers scored single runs in the second, third, and fifth innings. In the second, Hanna Aldrich had a leadoff double, moved to third on a single from White, and scored on an overthrow at home. Jaime Brown led off the third with a single, moved to third on a bunt hit from Liana Duarte and scored on a suicide squeeze from Mackenzie Handrahan. Taunton cashed in with another suicide in the fifth with Duarte laying down the bunt and sophomore Abbie McDonough (single) scoring. #3 Milford, 10 vs. #14 Bishop Feehan, 11 – Final (8 inn.) – Down to its final out, Milford rallied for four runs in the bottom of the seventh inning to tie the game and send it to extra innings. But Bishop Feehan bounced back in the top of the eighth to secure the win. Jess Tomaso hit a three-run homer to get Milford within one and Maddy Bonvino brought in Emily Hartman to tie the game in the seventh. #4 King Philip, 8 vs. #13 Hopkinton, 1 – Final – Each King Philip starter recorded at least one hit as the Warriors rolled to a win over Hopkinton. Elise Pereira dominated in the circle, allowing just one run while striking out eight to earn the win. #8 North Attleboro, 1 vs. #9 Braintree, 2 – Final – Click here for a recap of this game. #23 Foxboro, 13 @ #7 Bristol-Plymouth, 5 – Final – Foxboro scored five runs in the top of the first inning and never looked back in a win over Bristol-Plymouth. Freshman Morgan Sylvestre shined in the field with a handful of spectacular plays, and also made her mark with a team-high five hits at the plate. Senior Hannah Davis added four hits for the Warriors while playing terrific defense behind the dish. Emma Rohan pitched a complete game to earn the win for Foxboro. The Warriors will play #2 Plymouth South on Monday at 4:00 in a D2 South Quarterfinal matchup. Today’ game is listed below. Taunton, 2 @ North Attleboro, 0 – Final (8 inn.) – Taunton senior Kya Enos launched a two-run home run in the top of the eighth inning to lift the Tigers to a win. Taunton freshman Kelsey White and North Attleboro Bella Erti were both terrific in the circle for their respective teams. White allowed just four hits while striking out 12 in a complete game effort. The freshman retired 17 straight between the second and seventh innings. Erti was equally as good, allowing just two runs on seven hits with five strikeouts. 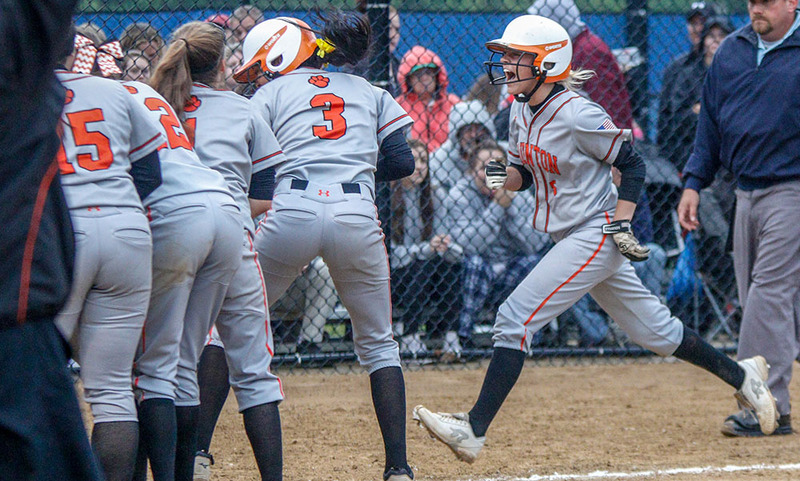 Alexa White led the Taunton offense with two hits while Liana Duarte, Mackenzie Handrahan, Jaime Brown, and Rylie Murphy each had one hit for the Tigers. Katherine Munley and Abby Gallagher had two hits apiece for the Rocketeers. Stoughton, 9 @ Canton, 6 – Final – Stoughton scored four runs in the sixth inning to overcome a one-run deficit and take a lead that it never relinquished. Jordan Lyons (3-for-5) had an RBI single to tie it 5-5 and Gina Carafa (4-for-4, two doubles, five RBI) followed with a three-run double. Freshman Nicole Baker added an RBI double in the ninth to add an insurance run. The Black Knights took a 2-0 lead behind four straight hits in the first inning. Stoughton made it 4-0 in the third behind a triple from Lyons and a double from Carafa. Canton plated four runs in the fourth to tie it and took a lead with a single run in the fifth. Milford, 2 @ King Philip, 12 – Final – Click here for a recap of this game. Taunton, 6 @ Dighton-Rehoboth, 3 – Final – Kelsey White pitched a masterful game allowing just three unearned runs on five hits, no walks, and five strikeouts. The freshman helped the Tigers overcome some uncharacteristic miscues on defense with her pitching and also made two key defensive plays. Alexa White also made a big defensive play at second, as did Mackenzie Handrahan in left field. Taunton put up two runs in the second when Hanna Aldrich scored on a wild pitch and Paige Silvia scored on an RBI single from Kelsey White. Taunton tacked on four more runs in the fourth highlighted by suicide squeezes from Aldrich and Liana Duarte. Milford, 0 @ King Philip, 5 – Final – King Philip ended the regular season with a win over Milford. Neither Marco DiStefano nor Nick Putney lost a single game at first and second singles, respectively. Sean Desroches picked up a 6-3, 6-0 win at third singles. The team of Nate Ihley and Aidan Ignatius notched a 6-0, 6-0 win at first doubles while Nich Ihley and Riley Outlaw prevailed 6-0, 6-1 at second doubles. Mansfield, 3 @ Westwood, 2 – Final – Juniors Luke Nickerson and Luke Devine picked up wins in singles action while Jalaj Singh and Sethu Odayappan capped their regular season with another win to help the Hornets edge Westwood. Nickerson won 6-1, 6-1 at first singles, Devine prevailed 6-0, 6-1 at third singles, and the first doubles pairing won 6-1, 6-2.